MISSOULA, Mont., Aug. 17 /CSRwire/ - This week, Smithfield Foods, Inc. and Albertsons joined forces to donate more than 35,000 pounds of protein to Montana Food Bank Network. 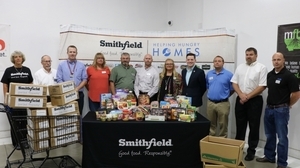 Smithfield’s contribution was part of the company’s 2018 Helping Hungry Homes® donation tour. Now in the program’s 10th year, Helping Hungry Homes® is Smithfield’s signature hunger-relief initiative focused on alleviating hunger and helping Americans become more food secure. The donation, equivalent to more than 141,000 servings, will help families fight hunger across Montana. Smithfield and Albertsons representatives presented the donation to Montana Food Bank Network at an event at the food bank this morning. Members of the organizations discussed food insecurity in the local community and the significance of this donation, which will provide protein throughout the food bank’s service area, reaching more than 130,000 food insecure individuals across Montana. This is the 41st large scale protein donation made by Smithfield to food banks across the country during its 2018 Helping Hungry Homes® tour. Since the program’s inception in 2008, Smithfield has provided more than 100 million servings of protein to food banks, disaster relief efforts, and community outreach programs nationwide. Montana Food Bank Network’s mission is to end hunger through food acquisition and distribution, education and advocacy. Their belief is that every person has the basic human right to access nutritious high-quality food that nourishes the mind, body and soul. The Network is made up of 238 neighborhood food banks, community pantries, social organizations, homeless shelters, schools and many other organizations committed to ending hunger in Montana. The Montana Food Bank Network distributes food across Montana from Heron to Wibaux, Eureka to Yellowstone and everywhere in between.